SUGEDIGI, Turkey—Turkish artillery fired into Syria’s Afrin region on Friday in what Ankara said was the start of a military campaign against the Kurdish-controlled area. Direct military action against territory held by Kurdish militia would open a new front in Syria’s civil war and would see Ankara confronting Kurds allied to the United States at a time when Turkey’s relations with Washington are reaching breaking point. “The operation has actually de facto started with cross-border shelling,” Turkish Defence Minister Nurettin Canikli said, adding that no troops had crossed into Afrin. 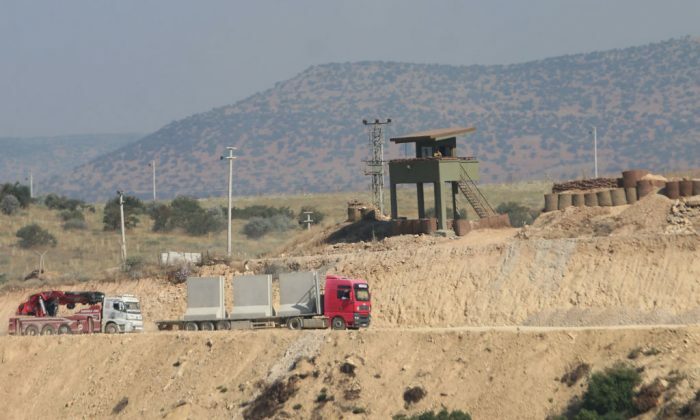 A U.S. State Department official said such moves would undermine regional stability and would not help protect Turkey’s border security. “We do not believe that a military operation serves the cause of regional stability, Syrian stability or indeed Turkish concerns about the security of their border,” the official told reporters, stressing he had limited information about Turkey’s reported military moves. The United States has instead called on Turkey to focus on the fight against ISIS terrorists and not take military action in Afrin. Reuters TV filmed Turkish artillery at the border village of Sugedigi firing on Friday morning into Afrin region, and the YPG militia said Turkish forces fired 70 shells at Kurdish villages between midnight and Friday morning. Shelling continued in the late afternoon, said Rojhat Roj, a YPG spokesman in Afrin. “YPG is ready to confront Turkish troops and FSA terrorists. If they dare to attack, we are ready to bury them one by one in Afrin,” a YPG statement said. Separately, Russia’s RIA news agency quoted Foreign Minister Sergei Lavrov as saying that media reports on Russian military units withdrawing from the Afrin region had been denied, though he did specify who had denied them. Turkey had sent its military chief to Moscow on Thursday to seek approval for an air campaign in Afrin, although Damascus warned it could shoot down any Turkish planes in its skies. Canikli said Ankara was determined to destroy the Kurdish group. “All terror networks and elements in northern Syria will be eliminated. There is no other way,” he said. Although Canikli said no Turkish troops have gone into Afrin, Turkish newspapers said 20 buses carrying Free Syrian Army rebels crossed on Friday from Turkey into a Turkish-controlled part of northern Syria, on Afrin’s eastern flank. Turkey has been angered by U.S. military support for the Kurdish YPG-dominated Syrian Democratic Forces which spearheaded the fight against ISIS in Syria, and by an announcement that the United States would stay in Syria to train about 30,000 personnel in the swathe of eastern Syria under SDF control. Turkey says the YPG is a terrorist group and a branch of the outlawed Kurdistan Workers Party which has waged an insurgency in southeast Turkey for decades, and Canikli criticized Washington for its continued emphasis on countering ISIS. “The threat of Daesh has been removed in both Syria and Iraq. With this reality out in the open, a ‘focus on Daesh’ statement is truly a meaningless remark,” he said.